There comes a time you really don't know what to do with a picture that went wrong somehow. Shall I use BW or sepia? Or shall I be bold enough to simply post it as is? There are purists and photo editing enthusiasts and everyone must cast their verdict but in the end the first person to be happy with the result must be you. Maybe not everything you do may be accepted as art, but as part of a creative process, photography, no matter how realistic it might be, implies perception, inspiration, technique and that mysterious magic nobody teaches you at school. Have you seen a child's face showing you that simple drawing you already discarded as too rudimentary? Did you notice how proud your kid was? Are you sure you saw all you had to see? Would two different people value the drawing the same way? What I want to say is that the important thing is to say something, convey your message based upon your own experience and reality. Where was I? Oh, yes. 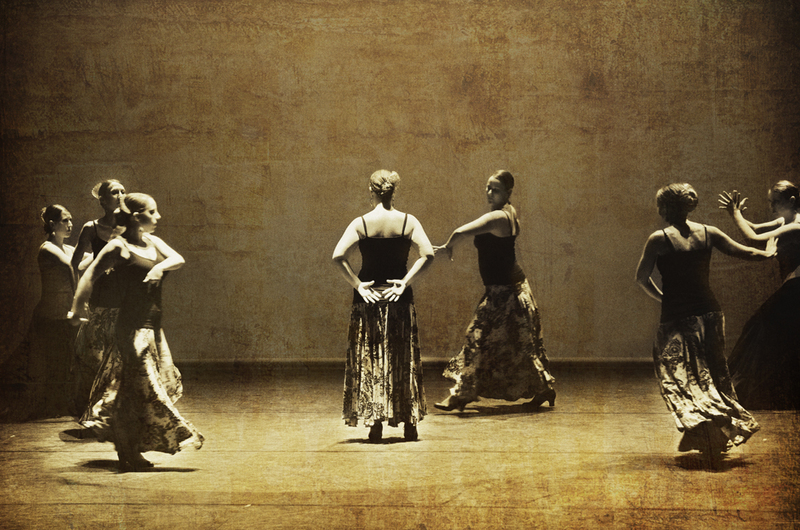 Here is a group of flamenco dancers each of them in what I thought was an interesting pose. The texture is just an additive to give some mood. I am not sure where I was heading to but had a good time editing! Stunning photo and the text you created to accompany it... you've hit the nail on the head. You must always try, do something. Kudos! I love the flamenco dance. It is sensual and at the same time romantic. Very interesting photo and great writing! So many times we are in too much of a hurry to notice the effort of other peoples intentions and creations, there's so much we never take the time to see. Keep up your good work!